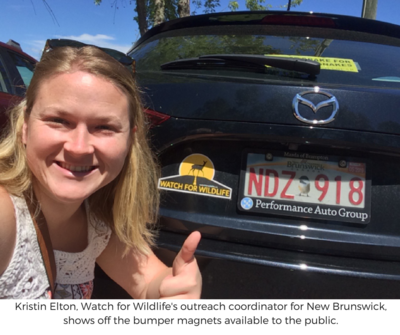 FREDERICTON, NB [July 9th, 2018]— Watch For Wildlife, a wildlife-vehicle collision prevention program of Sierra Club Canada Foundation, is expanding to New Brunswick this summer with the official launch happening this Saturday in Fredericton. Already running successfully for two years in Nova Scotia, the program aims to educate drivers about how to prevent collisions with wildlife and what to do if a collision does happen: a situation that most drivers in the province are all too familiar with. When it comes to sharing the road with wildlife, the main concern of many New Brunswickers is moose; and rightly so considering at least 400 moose-vehicle collisions happen every year in the province, often with tragic results. By creating awareness and educating residents and visitors to the region about how to prevent collisions, Watch For Wildlife hopes to reduce this number. Watch For Wildlife will be in Fredericton the weekend of July 14-15th for their official launch. You can find them at the Boyce Farmers Market on Saturday morning and at the Falls Brook Festival in Officers’ Square on Sunday where they will be facilitating a free workshop on the topic of wildlife and roads on Sunday at 11am. Program brochures and bumper magnets will be available. For tips on preventing wildlife-vehicle collisions, you can visit their website at www.watchforwildlife.ca or email watchforwildlife@sierraclub.ca for more information. Watch For Wildlife (W4W) is a wildlife-vehicle collision awareness and prevention program of the Sierra Club Canada Foundation with the goal of reducing injury and mortality of wildlife and people on our roads, and to encourage the implementation of wildlife-friendly road design and vehicle-collision mitigation measures. Watch for Wildlife is thankful for the support of the Animal Welfare Foundation of Canada, Lush Charity Pot and Animex - Wildlife Fencing. With their support we have been able to expand to New Brunswick this year.